The Big Idea: Counting everyday objects helps kids practice the important math skill of one-to-one correspondence. 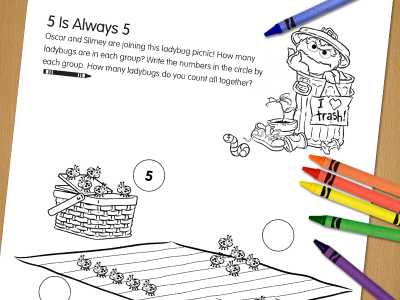 Print the page and help kids count the ladybugs in each group. Younger children can cross out each ladybug (or color it in) when they count it, to help them keep track. Explain that “five is always five.” No matter how the ladybugs are arranged (in one line, in two rows, or jumbled up in a circle), there are 5 in each group. Next, use small objects (blocks, small toys, or plastic spoons) to practice some more. Lay the objects out in several groups of five and ask kids to count each group. With younger kids, focus on one group of five. Rearrange the objects in different ways (in a line, in a circle or spread out), and ask kids to count them. Encourage kids to touch each object as they count it. In time, they will begin to understand that rearranging the items does not change how many there are. « Back to Five Is Always Five!